Chef Erika Araujo is a trained nurse from Mexico who found her passion for gastronomy once she migrated to Canada. 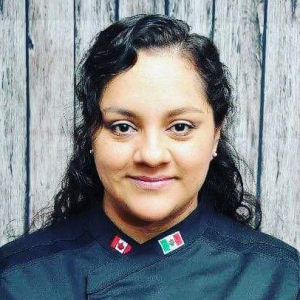 Since graduating from Humber College, Chef Erika has been tirelessly promoting and teaching traditional Mexican cuisine and culture through her company Ixiim Toronto. Along with catering events and teaching cooking classes to both adults and children, she also has a line of Mexican tamales and bread. Chef Erika has been on TV programs teaching the traditions of Mexican gastronomy. While participating in food competitions and food demonstrations she always brings the essence of what is most important to her, her Mexican culture. Chef Erika supports artists, musicians, and other entrepreneurs like herself, who embrace their roots irrelevant of where they are come from. Currently, along with her business partner Istra Avila, she is working on the opening of her new project, Mixi Culinary: a space open to those seeking to practice and share their traditional roots through food. Chef Erika believes that magic happens when you practice your traditions, honor your roots and share them wholeheartedly.